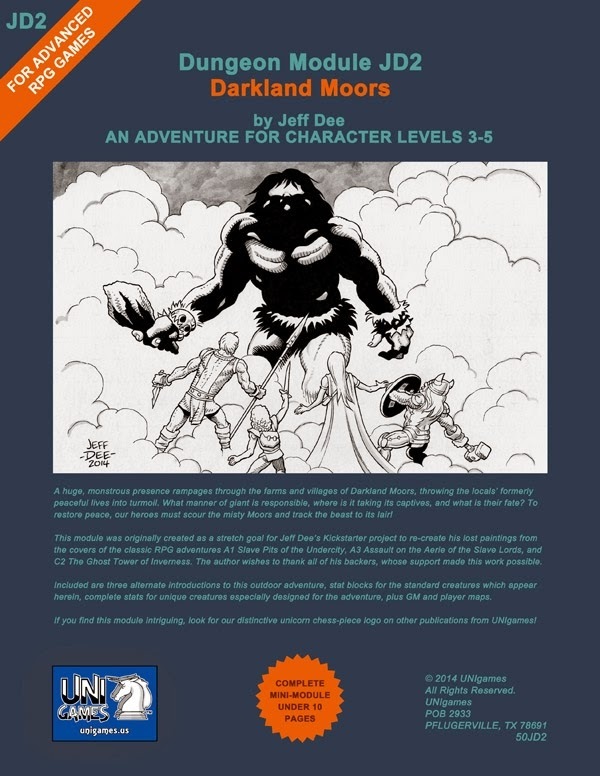 Jeff Dee (Classic D&D cover artist) has just released his second OSR module (and Kickstarter stretch goal) "JD2 Darkland Moors" over at RPGnow. This adventure is a follow-up to "JD1 Cess-Pit of the Bog-Queen" (reviewed here by Erik Tenkar). As it was a kickstarter stretch goal I got my copy yesterday but have only been able to do a quick digital flip through of the adventure. It is meant for players between the levels of three and five and from my quick look is a traditional HEXcrawl game. Artwork is sparse, but the cover ... oh man, the cover! ... is amazing in its black and white glory! A huge, monstrous presence rampages through the farms and villages of Darkland Moors, throwing the locals’ formerly peaceful lives into turmoil. What manner of giant is responsible, where is it taking its captives, and what is their fate? To restore peace, our heroes must scour the misty Moors and track the beast to its lair! This is the sequel to JD1 Cess-Pit of the Bog-Mother! This module was originally created as a stretch goal for Jeff Dee’s Kickstarter project to re-create his lost paintings from the covers of the classic RPG adventures A1 Slave Pits of the Undercity, A3 Assault on the Aerie of the Slave Lords, and C2 The Ghost Tower of Inverness. The author wishes to thank all of his backers, whose support made this work possible. Included are three alternate introductions to this outdoor adventure, stat blocks for the standard creatures which appear herein, complete stats for unique creatures especially designed for the adventure, plus GM and player maps. honestly I cannot wait to sit down and get in depth with this. I was impressed with and enjoyed JD1 immensely (and just a note I will be moving either Round Rock or Pflugerville in the next two years ... hint, hint) so I am sure this won't disappoint. Now just to wait for JD3!